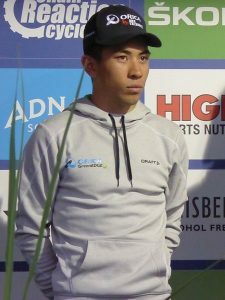 Photo: Caleb Evan, an Asian Australian road and track bicycle racer. Photo by Cs-wolves accessed on Wikimedia Commons. Asian Northern Australians are people identifying or identified as Asian sampled in the Northern Territory, Australia. In 2011, 2.4 million Australians declared that they had an Asian ancestral background (including Chinese Australians, Vietnamese Australians, Indian Australians, and Afghan Australians). In 2016, the population of the Northern Territory was around 244,000. The Asian – Northern Australian population data represents 225 individuals, self-identified as Asian residing in the Northern Territory, who were sampled in 2005 by the University of Technology in Sydney, Australia.